WINDSOR — For a New Canaan Rams team that has had a historic offense this season, it was the defense that propelled it to victory in the Class L quarterfinals Tuesday night. The No. 6 Rams defeated third-seeded Windsor 21-6 to snap the Warriors 22-game win streak, advancing to the semifinals, where they will host No. 7 Notre Dame-West Haven Monday at Dunning Stadium. With a constant downpour throughout the contest, the Rams offense and star quarterback Michael Collins (one touchdown, two interceptions) never quite got clicking, but the defense more than made up for it, registering four turnovers — one on a fumble recovery and three via interceptions by Andrew DeFranco, Ryan O’Connell and Kyle Smith. 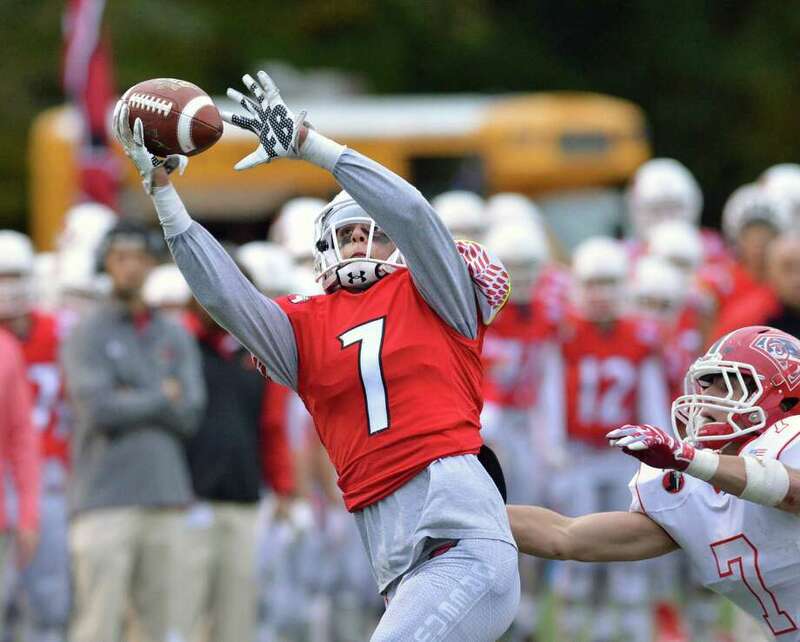 DeFranco’s pick at his own 7 stopped what appeared to be a promising opening drive for Windsor and New Canaan capitalized when Collins hit Peter Swindell for an 18-yard score. On the ensuing possession the Warriors fumbled the snap on a punt and New Canaan took over at the Windsor 2. One play later Mike Cognetta found pay dirt on a run up the middle. Windsor would go on to make it a one possession game at the half after Isaiah Huff (two INTs) picked off Collins and returned it to the Rams 26 where Tyler Coyle would eventually haul in a 14-yard pass from Jakhari Grant to make it 14-6 at the break. New Canaan played most of the second half without the Cognetta brothers, Matt, the team’s leading rusher, and Mike, a starting safety and running back, both of whom went down with injuries and that forced New Canaan to use O’Connell and Smith in unfamiliar roles. For Marinelli the decision to go with O’Connell and Smith to put the game away was an easy one, he saying he just put the game in the hands of his best players and allowing them to make plays. For Windsor the loss came down to the trenches. The Rams dominated the line of scrimmage on both sides of the ball, twice forcing a turnover-on-downs inside their own 15 yard-line.